Overnight rain meant that a wet track greeted the drivers sending many back to their pit tables changing setup and preparing their cars prior to round one, whilst enjoying the great food the onsite food chalet was serving. 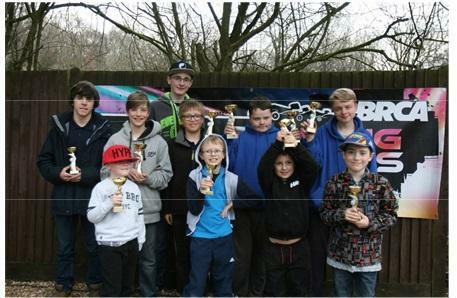 There had been several changes within the section over the winter period, with one of the biggest being the free entry being given to any junior racer within the series. This had resulted in a bumper entry of under 13 and under 17 drivers across all three classes. Another change was to see round by round qualifying replacing the FTD system used in previous years, which meant it was important to get out on track whatever the conditions presented. By the time driver's briefing had taken place, the sun was shining and the track was starting to dry. This left most scratching their heads trying to decide between the control Sorex 32 slick tyre, or the control treaded tyre. 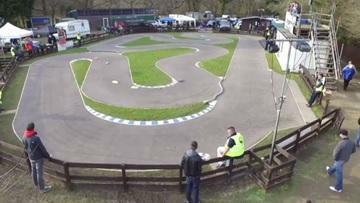 As the round went on, the dry patches grew larger and the track got faster and the lap times fell. New to the series for 2016, Formula One cars took to the track first and round 1 saw the drivers tip toe around the damp track on their control Ride slick tyres. Darren Ticker took the first round win ahead of F1 regular Stephen Lander with Luke Lee taking 3rd. Round 2 was again tricky for these rear wheel drive cars as the track was now mostly dry, but with damp patches on the straight under the drivers rostrum. James Wright took the fastest time in round 2, ahead of the consistent Stephen, with Darren taking 3rd. Round 3 saw a completely dry track and Mark Trinder took the fastest time in the round, followed by Richard Brown with Darren taking another 3rd. Darren's consistently good positions earned him the pole position for the 2 leg finals, with Stephen Lander lining up 2nd. Richard Brown ended up 3rd, James Wright 4th, Mark Trinder 5th, Rob Jackson 6th, Andrew Walters 7th, James Greener 8th, David Usher 9th and Mike Haswell rounded out the top 10. In the first leg final Stephen Lander took the lead on the last lap after James Wright had an off, crossing the line less than half a second behind his team mate. In the second leg James Greener stormed through the field from 8th on the grid to take the win ahead of Andrew Walters, with a Mark Trinder getting caught up in traffic on the final lap to take 3rd. So 2 very different results from the 2 leg finals meant James Greener took the overall win ahead of Stephen Lander, with James Wright taking the final step on the podium. 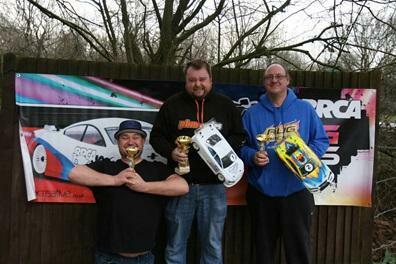 The 17.5 Blinky class saw reigning champion Colin Jackson return to defend his title, but it was Danny Booker who took the fastest time in round 1 ahead of 2014 champion Dominic Skinner. Shaun Batt took 3rd ahead of Colin in 4th. Rounds 2 and 3 were both fully dry and normal service was resumed with Colin taking the fastest times in both round 2 and 3. 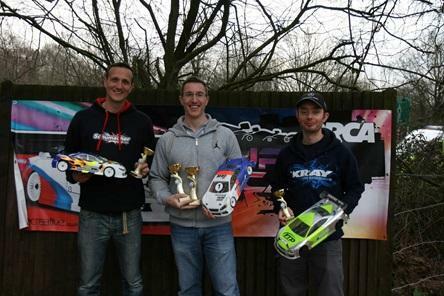 'Mr Rug Racers' Malcolm Hall took second in both rounds behind Colin, with Dominic 3rd and Danny 4th. So after the 3 rounds of qualifying Colin took the pole ahead of Malcolm. Danny's round 1 score saw him line up 3rd ahead of Dominic in 4th, Shaun Batt 5th, Darren Ticker 6th, Mark Trinder 7th and Nigel Shaw 8th. Reigning under 13 champion Jak Sansom proved he could still mix it with the adults having moved up into the under 17 age group by lining up 9th with Jack Campfield taking the final spot in the A main. 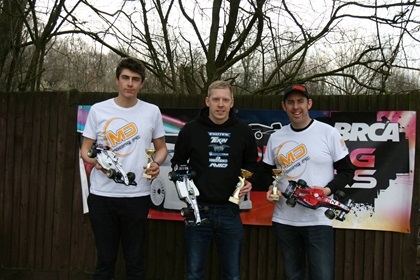 Faultless drives in the finals saw Colin take an untroubled double win with his Awesomatix for maximum championship points with Malcolm and Danny taking a second and third each with Malcolm taking the overall 2nd place based on his better qualifying position, leaving Danny 3rd overall. Jack Campfield took a well earned 4th overall from 10th on the grid with many ahead of him getting caught up in some fierce battles and some car failures. In 13.5 local favourite and defending round winner Tim Hancock took the first 2 round wins to take the pole for the finals, with defending series champion Liam Brooks taking 2nd in round 1. Dale Burr took second in round 2 and followed it up with a round win in round 3 meaning Dale lined up 2nd behind Tim. Adrian Bidewell showed great consistency to line up 3rd, equalling Liam's combined scores but taking the place on best time, by just 0.14 seconds. Liam would start the finals 4th, Jack Ioannou 5th, Ben Cane 6th, Tim langdell 7th, Luke Burr 8th, Richard King 9th and top junior and reigning under 13 class champion Ben Moorey rounding out the top 10. The finals saw race long battles between Tim and Dale, but Tim was able to hold on in both to take the overall win with his trusty ARC. Dale took a well deserved 2nd overall with Adrian and Jack both taking a 3rd and a 4th place each. Adrian's better qualifying position gave him the place though and the final step on the podium. Having remained dry all day, the heavens opened just at the end of the trophy presentation and the racers were treated to a spectacular thunder storm and torrential rain as they were packing up. Despite this, the Eastbourne Club put on a fantastic event. The track was prepared faultlessly and the meeting ran without a glitch. 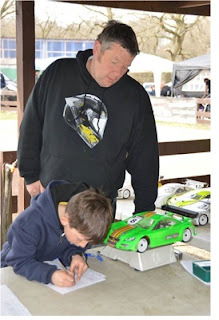 Special mention goes to young James Relf, who spend the day eagerly scruiteneering the cars, even tracking down drivers where advice needed to be given. Well done James, and thank you for your effort.